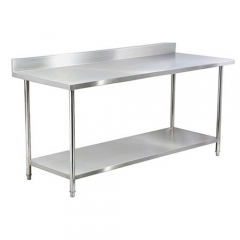 Great for chopping, sorting, and assembling, this work table provides a sturdy, spacious surface for food prep and storage. With its high weight capacity, easy-to-clean surface, and overall functional design, you can organize your kitchen to create an efficient work flow. This top shelf has a large weight capacity. and is made of 201 stainless steel to provide a sturdy surface for kitchen prep tasks. 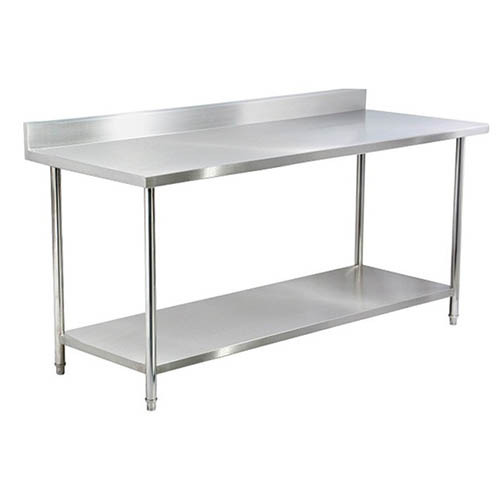 With its superior corrosion resistant and easy-to-clean surface, this work table provides you with additional work space so you don't have to overcrowd your countertops! When placed off of the ground, this shelf complies with food safety regulations. You can store flour, sugar, and more on this shelf to keep all of your most used supplies organized and within your reach. Adjustable bullet feet allow you to level your table on uneven surfaces for the best possible stability. Steel legs support the tabletop and provide excellent corrosion resistance. This table ships unassembled to save you on shipping costs. An spanner and two set screws are included for easy assembly.